Police in several US states responded to reports of at least a dozen chaotic incidents at shopping malls on Monday, including melees involving hundreds of people and false alarms about gunfire. The disturbances broke out on the post-Christmas shopping day as many stores reopened. This year, December 26 was observed as a federal holiday in the US as Christmas Day fell on a Sunday. While many retailers have taken on the tradition of Britain’s Boxing Day sales, it traditionally pales in comparison to the US shopping extravaganza that is Black Friday, the day after Thanksgiving. Police departments across the country were alerted to several reports of gunshots and mass brawls at a number of shopping centers, forcing shoppers to evacuate and malls to close early. Up to 10 people were injured, including two children, when chaos broke out after the noise of a chair hitting the ground reportedly caused someone to shout “gun” in the mall. The Mayor of Elizabeth took to Twitter confirming that no shots had been fired, but that a fight had broken out. Armed police responded to the incident and evacuated the building. (3/4) Two injuries reported of an 8 year old w/ cut finger and a 12 year old w/ leg injury. No others reported hurt at this time. (2/3) A total of 8-10 people were injured today with non-life threatening injuries and were treated on scene. 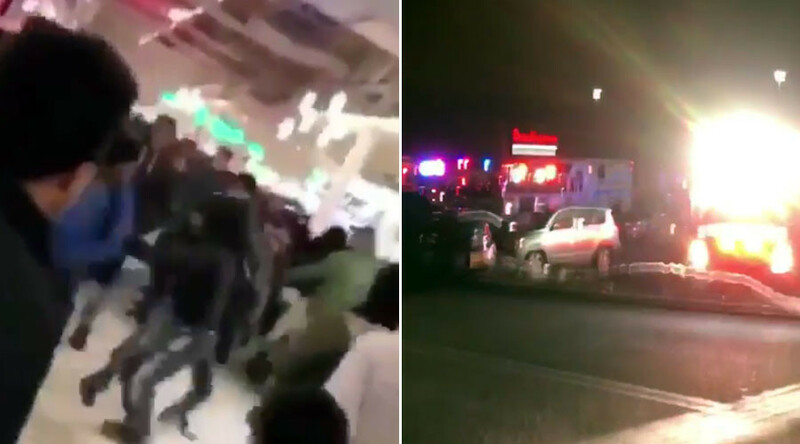 North Carolina’s Cross Creek Mall was also evacuated, at the decision of the owners, after a brawl broke out between teenagers at the food court. Fayetteville Police Department confirmed they received reports of gunfire, but could not confirm any shots had been fired and found no gunshot victims or damage to property. Fort Worth Police said up to 150 teenagers were involved in a mass brawl that erupted at Hulen Mall forcing management to put the center on lockdown, according to NBCDFW. Officers were responding to alleged gunshots in the mall parking lot when the fight erupted in the food court and spread to other parts of the mall. Police are investigating if the incident was organized online and if it is linked to other large-scale disruptions at malls across the country. The Fox Valley Mall was closed early Monday night after a fracas broke out in the food court. Up to 75 police officers attended the scene as seven juveniles were arrested and more were questioned, according to ABC7 Chicago. No serious injuries were reported. Aurora Police Department shut down the Town Center Aurora after multiple clashes took place at the center, reportedly involving some 500 people. Five juveniles were arrested on charges of disorderly conduct. Police say the fight had been planned on social media, according to Fox31 Denver. #APDAlert: Large disturbance at @TCAurora.Mall is being closed and evacuated by APD. No one else is being will be permitted into the mall. At least 500 people involved in the disturbance at Town Center in Aurora. Five arrested, all juveniles. Charges of disorderly conduct. Arizona Mills mall in Arizona was put on lockdown by management after reports of shots fired inside the shopping center. Local police confirmed no evidence of gunfire was found. Two people, including a juvenile, were arrested after two fights broke out at the mall. Another false ‘shooting’ created mass hysteria in the Beachwood Place mall, causing police to use pepper spray to disperse a large crowd, according to Cleveland.com. While police said there was no shooting they confirmed a large disturbance had broken out resulting in the arrest of one juvenile for assaulting a police officer. Hundreds of teenagers took part in several fights at the mall resulting in eight arrests and closure of the center. One Manchester officer was assaulted while trying to break up a fight but was not seriously injured. Police confirmed four arrests were made during an “incident involving several youths” at the Monroeville Mall on Monday. This comes two years after a huge brawl on the same date which resulted in a several arrests and injuries. Mall disturbances were also reported in two centers in Memphis, Tennessee and Long Island, New York. Investigations are ongoing to establish if there is any link between the melees.